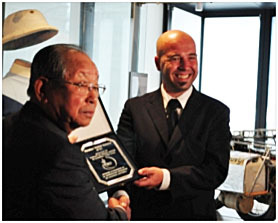 Yoshio Yoshida, member of the IBAF Olympic Reinstatement Commission (ORC) and NPB Hall of Famer will be visiting Rome on Tuesday, June 26th to meet with IBAF President Riccardo Fraccari to discuss ongoing matters of Baseball reinstatement onto the 2020 Olympic Programme. He will be accompanied by Mr. Didier Seminet, President of the Federation Francaise de Baseball et Softball (French Baseball and Softball Federation). Yoshida managed NPB Hanshin Tigers three times in 1970s-1990s and he led the team to the NPB Championship in 1985, only time Hanshin Tigers won the series in its history. Living in France in 1989-95, he also managed the French national team and during his tenure, the team participated in two Olympic Qualifying events as well as various European competitions.